Watch your child reach for the stars with this twinkling growth chart. Chart your child's growth skyward with this twinkling chart that tracks your not-so-little one's growth up to 5' 2". 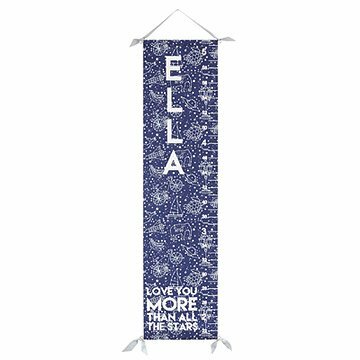 Featuring a navy blue sky shining with an array of creative constellations, this whimsical keepsake is personalized with the child's name and has the option to be finished with the touching reminder "love you more than all the stars." Printed in Oregon with high-quality inks on museum grade canvas. Perfect Gift ...Looks Great in Nursery! It was a gift for newborn grandson, his parents loved it and immediately hung it in the nursery. The colors and design were a perfect addition to the nursery and it will be a forever gift. This was such a beautiful gift for an intelligent 3 year old. She loves to read her name so she loved the personalized element. It looks absolutely beautiful hung up and feels like a high quality decorative element. This was a great gift for a friends baby shower. She acsokutely loves it and it was a perfect fit for her star theme. Made Me Grandma Of The Year! I bought this to match the solar system print by the same designer since my daughter and grandson loved that so much. This is just as spectacular and they look great in his room! My grandson loved getting to measure himself. Both are truly uncommon quality and I love knowing these will be saved forever for memories. unique, lovely, great gift for small child. I love to give gifts personalized with names, and this is a fun, useful gift for a small child. It's also attractive and would fit into many child's room decor. A beautiful, unique gift for a child. It is even more special because it's personalized with the child's name. The child's parents loved it and I like knowing that it will be a part of his life as he grows older. This was a wonderful gift to give to my God Son. The fabric is nice and thick and a rich/deep blue. His father loved it too and I can envision many years of them using this. This is simply gorgeous. It was a gift for my granddaughter on her first birthday . My daughter and son in law absolutely love it!